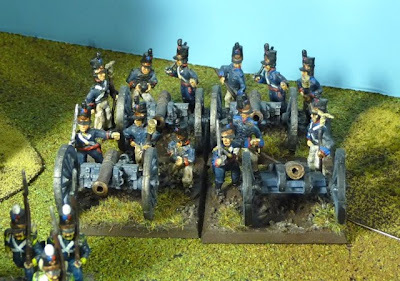 This unit is comprised of figures which were my first attempt at painting 28 mm Napoleonics. I started these figures in the late spring of 2006. Looking back at the figures now, I can see my painting style was quite rudimentary, but I think fairly accurate in respect to the uniform details, aside from a few idiosyncrasies. 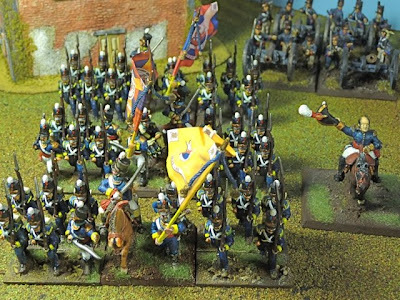 The first figures I bought were Foundry which make up the majority of the figures in the 1st Brigade, as well as Major General Picton. My big purchase of Front Rank Figures came in January of 2007, and these can be seen in the 3rd Brigade. The 2nd Brigade is mixed. 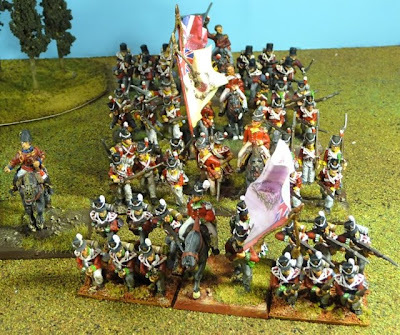 The 2 English brigadier generals and the Portuguese artillery (actually converted British) are from Redoubt, these were painted about a year ago. I really find Redoubt figures are no match in quality to Front Rank or Foundry. Artillery units are quite expensive, and I got these at 80% off. I have recently moved the figures around so the rank and file in each battalion are from one manufacturer. 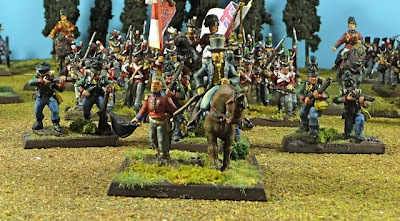 A bit of repainting of facings and base repairs were required, but the figures are otherwise as painted at the time. 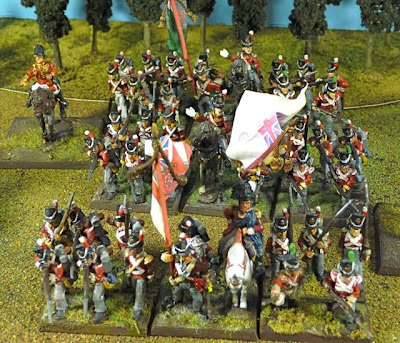 Most of the British battalions at the Battle of Fuentes de Oñoro fielded a little over 500 men, so the figure ratio here is around 1 figure for every 40 men. 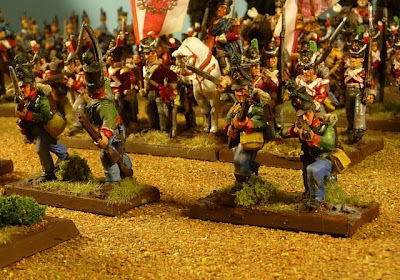 I have not bothered with grenadier companies, but each battalion has their light company based a skirmishers (2 figures). Sir Thomas Picton, as he would have appeared at the Battle of Waterloo, but who could resist. 1st Brigade, led by Colonel Henry MacKinnon. The 74th Highland Foot was de-kilted by this time, but for some reason that escapes me now, I decided to dress the battalion colonel in full highland kit. Next is the 1st battalion of the 88th Foot, the famous Connaught Rangers. 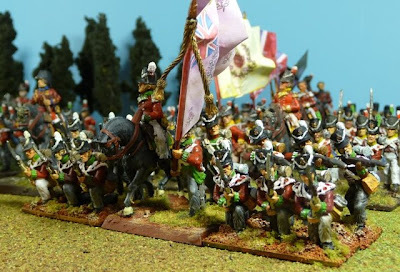 The last unit is the 45th (Nottinghamshire) Foot. The 60th Royal American Rifles had three companies assigned to this Brigade. 2nd Brigade, led by Major-General Charles Colville. Leading the brigade are the 5th (Northumberland) Foot, followed by the 2nd battalion of the 83rd Foot and the 2nd battalion 88th Foot. The last battalion in the OB is 94th (The Scotch Brigade) Foot. Portuguese Artillery, 4 batteries were at the battle, de Preto's and de Rozziere's of the 1st (Lisbon) Portuguese Artillery Regiment and de Sequerra's and Rosado's batteries of the 2nd (Algarve) Portuguese Artillery Regiment. each battery had five 9 pounders and one 5.5" howitzer by 1812 in Wellington's army. There were around 140 men in each battery, thus 3 figures on each stand. 5th battalion, 60th Royal American Rifles, with slightly lighter green jackets then the 95th, red facings and nice blue trousers. Fine collection, and nice to see someone doing the 60th Rifles for a change. Add I have to admire the chutzpah of a man who decides to paints highlanders in kilts- especially when he has the historical justification to avoid the task! Reluctance to paint tartan is one of the reasons I've never had a British army. You have not seen the kilts yet Robert, I have 3 battalions (2x 14 figures and 1 x 25 figures) all kilted out and ready to go once I finish 2 more Foot battalions. You *really* want to paint 3 straight Highlanders battalions in kilt? Fortunately, they are done and based aside from 6 figures, which I am short because I changed the size of the battalions. I have discovered you blog today!. No my sacle but I like very much your models and your painting technique. Thanks Rafael, I have been acquainted with your blog for some time, an excellent resource.